FSTOP123 - Outstanding Stock Photography - Knowledge is Power! Great fun recently as we took a group of kids into a library and let them enjoy the books and technology all around them! This photo and video shoot was such a blast with an awesome cast of characters... These cute little actors had such a great time, we doubt they were acting too much at all! 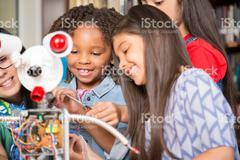 From constructing a robot, to reading a variety of books, to coding on computers, this group of children (and adults, too) made this shoot one of our most successful to date! Be sure and check out all the images and videos from this shoot by clicking the link below. To view or download the image above, just give it a click!